Very attractive and reliable SUV. I have really not had any problems in the short while that my son and I have had the vehicle. 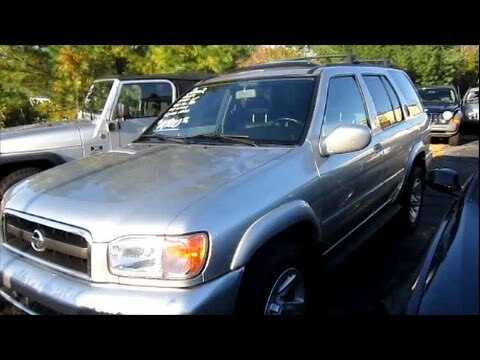 I have had a pathfinder before and drove it for years with the only problem was with the transmission after years of use. The 2002 only has an issue with having to buy a new battery which is normal. Drives smoothly still. Very comfortable. All buttons have easy access. Color is gorgeous. Easy to navigate during the snowy seasons. Great ac system in the hot and humid seasons. I definitely recommend the Nissan pathfinder to anyone and everyone. A dependable and durable car. This SUV is very reliable. It performs well on long trips and does well on most surfaces. It works well on both urban streets and rougher terrain. The tech is not quite up to what one would expect in a newer vehicle. But its is comfortable and easy to use. The best features are the sunroof which is great for sunny weather, and the four wheel drive which is very handy in tough conditions. Good inexpensive single and/or family car. Personally it's worked pretty good so far. Some of the problems that I have had are the windows do not roll down all the way, the seat adjuster shifts, and it constantly needs washing. The pros of having this car are that it's good on gas, comfortable, a lot of trunk room, durable, and has a decent stereo. I recommend this car for anyone looking for an affordable and safe car.